I just launched a new beta app which is a completely revised version of my other app. Everything in Material Design (well mostly) and it's actually working WITHOUT root! I hope you can give some feedback in order to improve it, because it's still in development. Many more features will be added in the future. 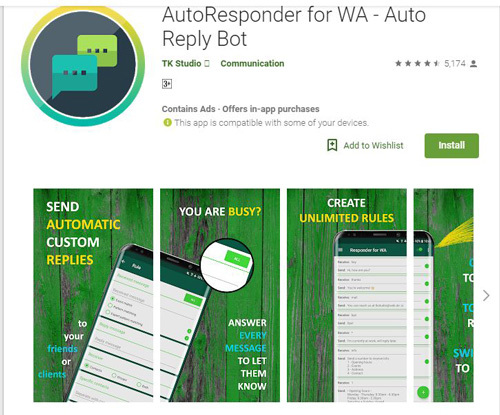 Automatically reply to custom received WhatsApp messages with the help of this app. You have a lot of settings to customize the bot for your needs. Just try it out! - App is still in development, many more features will follow! Don't forget to hit the thanks button, thanks! Download NOW! Create the best experience for your contacts! This app is NO fake. Just try it! Emojis can be used by copying them from WhatsApp or adding them with your keyboard directly. Pictures like wallpapers, videos or any other media files can't be sent. Update WhatsApp messenger apk to the latest version if the bot doesn't work for you. In case the beta update doesn't work anymore, please contact me. Doesn't work with WhatsApp web and tablet apps. Dual/Clone WA apps can work, depending on how they operate. Works with WhatsApp Business. This tool doesn't directly access WA, it replies to notifications. Location permission: Possibility to auto reply with current location. Okay, this app isn't affiliated with WhatsApp™.